The first Kingston workhouse was set up in 1725 in rented premises near the site now occupied by Surrey County Hall. The poor were "set to work in order to introduce among them habits of virtue, sobriety, obedience and industry and labour, prevent an entail of poverty and idleness and to keep them at work and from begging about the streets and pilfering and other vices and idleness." 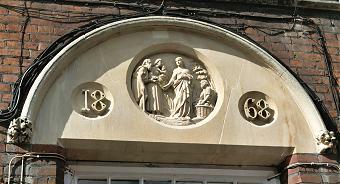 In the late 1700s, the workhouse was moved to a house in London Road, opposite the junction with Coombe Road and later the site of the Norbiton bus depot. A parliamentary report of 1777 recorded parish workhouses in operation at Kingston (for up to 288 inmates), Esher (34), Mauldon (12), Thames Ditton (30), Hampton Town (30), and Hampton Wick (6). Wimbledon's parish workhouse, erected in 1752, stood at the north side of what is now Camp Road (formerly Workhouse Lane). The Hampton parish poorhouse is referred to, though not precisely marked, on the 1871 Ordnance Survey map. It was located a mile to the north of Hampton, at the north side of Hanworth Road. the building was close to the south-eastern end of the baseline measured by General Roy in 1784 across Hounslow Heath, from King's Arbour to Hampton poorhouse, which laid the origins of the Ordnance Survey. Surrey: Esher, Ham with Hatch, Kingston (5), Long Ditton and Talworth (2), Malden, East Moulsey, West Moulsey, Thames Ditton (2), Wimbledon (2). Middlesex: Hampton (3), Hampton Wick (2), Teddington. Later additions: Coombe (1894), New Malden (1894), Surbiton (1894), Tolworth (1895). The population falling within the Union in 1831 had been 18,085 with parishes ranging in size from Hook (population 189) to Kingston itself (5,989). The average expenditure on poor relief for 1833-5 had been £11,280 or 12s.6d. per head of the population. 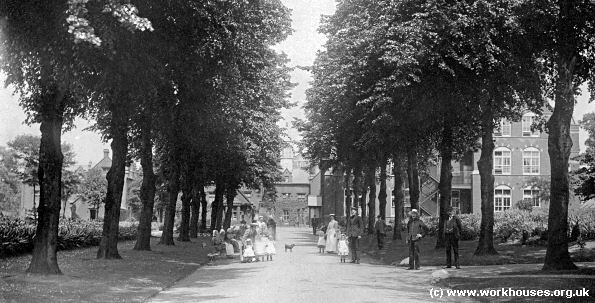 Kingston workhouse entrance driveway from the south, c.1910. Kingston workhouse entrance driveway (detail), c.1910..
An H-shaped infirmary had been built at the north-east of the workhouse in 1843. It could hold between 80 and 100 patients. A larger infirmary was erected at the south-west in 1868. Kingston 1868 infirmary from the south-east, 2001. Kingston 1868 infirmary entrance from the east, 2001. In 1894, the Guardians' minutes recorded that "the house was clean and in good condition" and that "the bread was fairly good,". However, some of the men in the receiving ward complained that their clothes had been gnawed by rats (Orton, 1965). The Chairman of the Board said that it was a new building and he could not for the life of him make out how it could be infested with vermin, but a Mr. Andrews offered to point out six or seven rat holes "any time the chairman liked." At another meeting, the workhouse master, Mr. Gardiner, reported that three hundred and ninety-four inmates were in residence, and had helped two hundred and forty tramps "during the past fortnight." At the same meeting it was agreed that all the old women should be given the option of having teapots and making their own tea. Following allegations that tramps were being ill-treated, the Hampton Parish Overseer, Mr. Austin, moved that "the barrel cages now used as cells for tramps to pick oakum in be pulled down and entirely done away with." Seven years previously he had found these cages full of tramps, locked in and unable to obey the laws of nature. Despite the Board's instructions, two years ago the cages had again been full. One very cold day a man had said, "This is horrible. I would rather be in prison any time than here. I should get better food and should not be shivering in cold to catch my death." Mr. Austin asked the Board "in the name of Christianity and humanity to do away with the cages" — his resolution was carried. 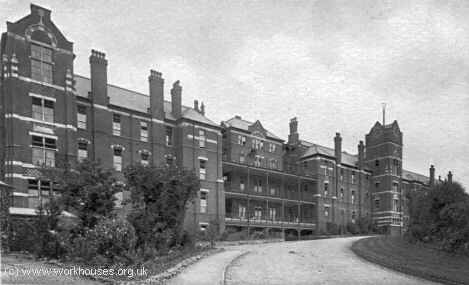 In 1897-9, a new infirmary complex was built at the north of the workhouse, together with a nurses' home. In 1902, the infirmary was separated from the workhouse and became known as Kingston Infirmary. During the First World War it provided care for military casualties. 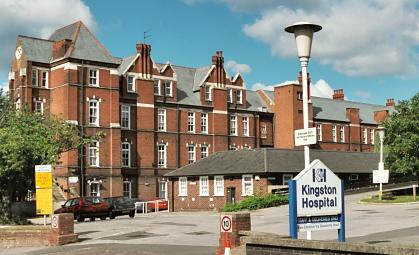 In 1920, it was renamed Kingston and District Hospital. Kingston infirmary from the north-west, c.1917. A new larger nurses' home was built in 1928 to the west of the hospital with an lodge at the entrance from Wolverton Avenue. Kingston 1928 nurses' home and Wolverton Lodge from the south-east, 2001. After 1930, the workhouse became the Kingston Central Relief Institution, then after 1948 was integrated as part of Kingston Hospital. A large redevelopment programme has seen the demolition of most of the former workhouse buildings, with the main workhouse block being replaced in the 1960s. By the early 1900s, the Kingston Union had established a number of children's scattered homes. In 1908 these comprised: Franklyns, Cedars Road, Hampton Wick; 14 Anlaby Road, Teddington; Sherborne Lodge,4 Adelaide Road, Teddington; Normanville, 94 Church Road, Teddington; Connaught Villa, 81 Coburg (now Connaught) Road, Teddington; Bedford Villa, 6 Hampton Road Teddington; Pevensey Villa, 174 Merton Road, Wimbledon; 3 Gap Road, Wimbledon; and 65 Griffiths Road, Wimbledon. Most of the homes housed around a dozen children who were in the care of a foster parent or superintendent. The list of homes changed slightly over the years, with some closing and others opening. Some locations used in later years were: Beech Holme, Wellington Road, Hampton Hill; Fairlight, Uxbridge Road, Hampton Hill; Tudor Lodge, Vicarage Road, Hampton Wick; 7 Stanley Road, Teddington; and 36 Griffiths Road, Wimbledon. The homes also had a Central Home at 163 Kingston Road, New Malden, which provided accommodation for 28 boys, 28 girls and 28 younger children in a creche. Another property, Moira House on Old Bridge Street, Hampton Wick, was used as a Receiving Home for new admission to the homes. Surrey History Centre, 130 Goldsworth Road, Woking, Surrey GU21 6ND. Holdings include Guardians' minutes (1839-1930 with gaps); etc.